Home at last! It had been a long flight. I got out of the taxi that had pulled up late one night and I walked up towards my wife. She was standing in the light of the doorway like so many times before. But this time it was different. As I hugged my wife, my head was still spinning with the impressions as I tried to explain what had happened. It all wanted to come out at once. There were words about a long flight, a talk about leadership, and great ideas. “Guess who sat in the row in front of me?” was perhaps the only sentence that made sense coming from my mouth. I was so excited. There were more words like, security, delay, rushing and waiting, boarding, and more waiting, a stewardess on her knees, the Swedish King and Queen, and the personal assistant to the King sitting next to me. My wife and I continued with our conversation in the kitchen as I explained how I had spent half the night’s flight talking and exchanging ideas about leadership. I can’t really remember how our conversation in the kitchen continued in detail but I do remember how it ended. “You should write a book”, she had said repeatedly. But I put it off immediately every time. “A book, what about?” I had read so many books on leadership that had had so little impact on me. Why write another book full of theory that you recognize and that you don’t know how to apply? “No,” she had said in the end. “Write your story. About all the flights you made over the last two years to coach that group of managers. And how you helped them becoming better leaders. Write how they became successful without reorganising or investing money! Just write a book about the whole journey!" It was late. My wife wanted to go to bed. I lay in bed wide-awake. She was right. This would be my story about the whole journey. My true story about how I coached a group of managers to become real leaders and increase their company’s effectiveness by 50%. Now you can start your journey. 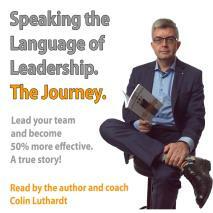 Speaking the Language of Leadership, the Journey shows you the insights how leadership really works in multiple situations. It gives you the background so that you can get a better understanding of your communication with your team. It helps you discover what it takes to become an even more effective and confident leader of your team.